With George Washington eager to retirement, numerous potential successors have been proposed to follow the “Father of our Country” as the next president. While John Adams is the presumed heir, many critics of the Washington administration have proposed Thomas Jefferson, a major of Hamilton’s economic policies and John Jay’s treaty with Great Britain. Dominating this election are the events in Europe, predominately the French Revolution, which hampers trade and commerce abroad, and potential stability domestically, as the elites fear an uprising by the masses in America. A new Revolution at home was a realistic enough supposition that even former anti-Federalist Patrick Henry converted to the Federalist Party, as he feared a populist revolt. The John Jay Treaty is arguably the major issue of the election. This treaty probably prevented a new war with Britain, solidified our Western frontier, and somewhat strengthened relations with our former cousins, but to many it did not go far enough–lacking compensation for sunken American ships and impressed sailors by the British. The Jeffersonian Republicans also saw the treaty as a direct violation of our alliance with France; although, Federalists declared the alliance over after the French executed their king and declared a new government. 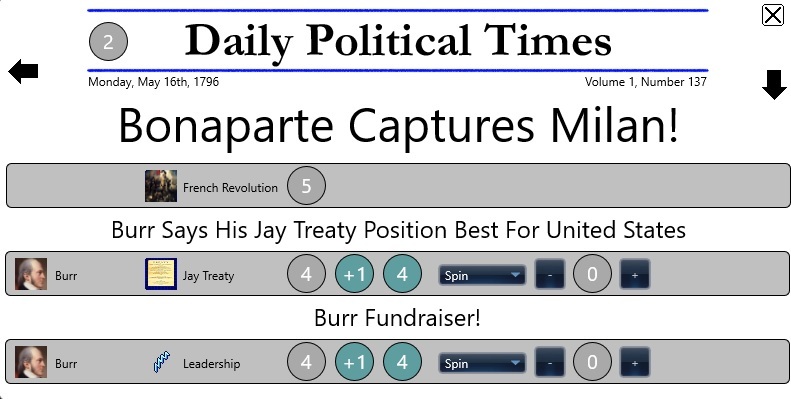 Additionally, a new figure–Napoleon Bonaparte–dominates the headlines, who could determine if America leans pro-British or pro-French. John Adams was expected to follow Washington into office, but it was understood that he would face real opposition, unlike with Washington. Adams had believed that Thomas Jefferson, Alexander Hamilton, George Clinton, John Jay, and Patrick Henry were his likely competitors, but of these only Jefferson, and to a lesser extent, Burr, posed any real threat. Federalists had decided to lead their support for Adams, except for a failed attempt by Hamilton to get Thomas Pinckney elected over John Adams. For the the Republicans, Madison and others had convinced Jefferson, who pretended to be reluctant to return to public life, to run for president against his close friend, John Adams. Just as the Federalists needed a Southerner to balance their ticket, the Republicans needed a Northerner, and naturally New York carried the most weight. Rather than going with the usual George Clinton–who had just lost reelection for governor of New York to John Jay–Republicans opted to favor young Aaron Burr. This election followed the old rules which required Electors to cast two votes, one presumably for president and one for vice president. However, electors didn’t strictly vote along party lines, and many Federalists voted for candidates that weren’t Adams or Pinckney. As such, while John Adams won the election, Thomas Jefferson became his vice president, rather than Thomas Pinckney. Can defeat John Adams and begin the Jefferson presidency four years earlier? 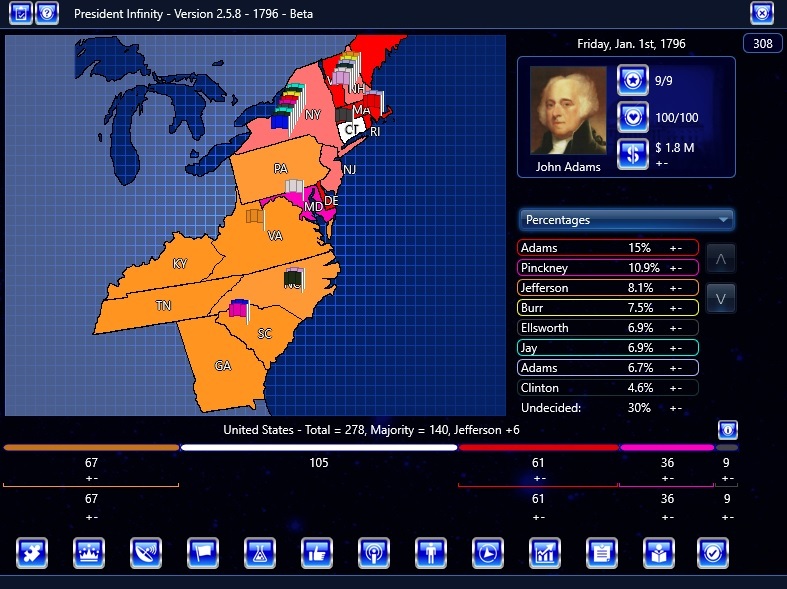 Play as Thomas Pinckney and ensure that you become Adams’s VP. 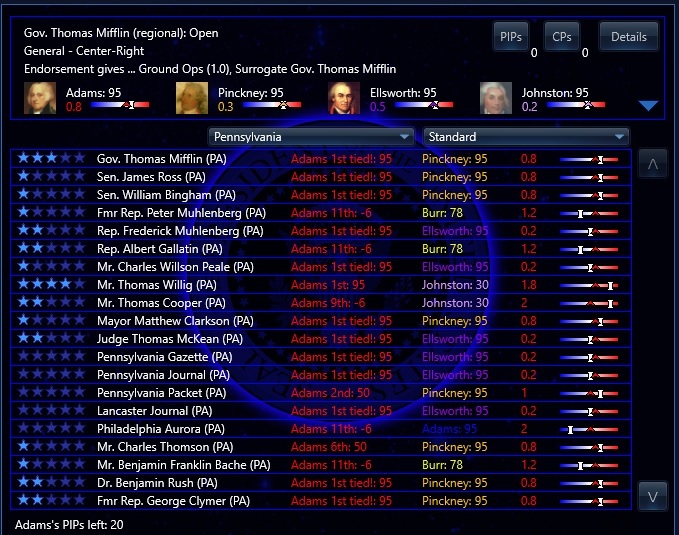 Play as one of many “minor candidates” such as Samuel Adams, Oliver Ellsworth, John Henry, James Iredell, Samuel Johnston, and future two-time Federalist nominee Charles Coatesworth Pinckney. What if George Washington ran for a 3rd term? What if Alexander Hamilton had opted to follow Washington into office? What if James Madison had asserted himself into presidential politics earlier? What if James Monroe, leader of the more conservative faction of Republicans, had decided to run earlier? What if recently converted Federalist Patrick Henry had decided to run? What if the recent debt-ridden “Financier of the Revolution” Robert Morris had run to repair his reputation?